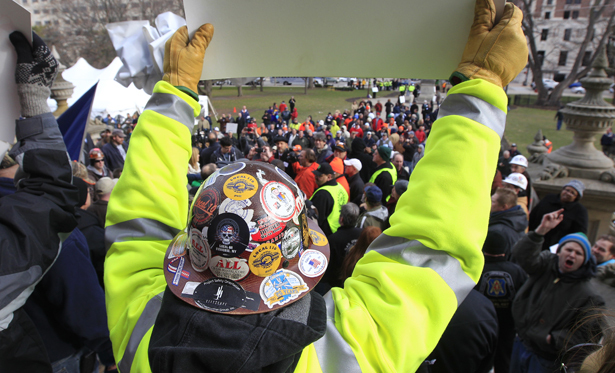 In one day, Michigan legislators announce and pass “Right to Work”—really “No Rights at Work”—legislation. In the state where workers sat down in Flint General Motors plants seventy-five years ago and emboldened the industrial labor movement that would give birth to the American middle class, Republican legislators on Thursday voted to gut basic labor rights. President Obama has long opposed so-called “right-to-work” laws and he continues to oppose them now. The President believes our economy is stronger when workers get good wages and good benefits, and he opposes attempts to roll back their rights. Michigan—and its workers’ role in the revival of the US automobile industry—is a prime example of how unions have helped build a strong middle class and a strong American economy. But, while the president carried Michigan by a 54-44 margin on November 6, neither he nor his fellow Democrats were calling the shots Thursday. Snyder, a Republican, has indicated that he will sign the measure that was passed during a lame-duck session of the legislature. This was theme or protests throughout the day, as Michigan unions made the point that undermining labor rights undermines the living standards of all working people—not just union members. But they were not taken seriously by the Republicans who—though they suffered setbacks in the November 6 election—control both chambers of the Michigan legislature. Swift and UAW president Bob King were among hundreds of workers who were locked out of the Michigan Capitol Thursday, as protesters inside were pepper-sprayed and arrested by State Police. The Republican legislators evidenced no intention to listen to logic, or to entertain honest debate. GOP legislative leaders had plotted behind closed doors with Governor Snyder, to have Michigan join the traditionally lower-wage states that decades ago enacted “right to work” laws to thwart the rise of a labor movement that promoted civil rights, women’s rights and economic justice. The Michigan legislation goes much further than proposals advanced last year by Republican governors in Wisconsin and Ohio, which targeted public employees. Under the Michigan legislation, basic labor rights are stripped away from both public and private-sector workers. That’s not the only difference between Michigan Governor Snyder and Wisconsin Governor Scott Walker, whose name became synonymous with aggressive anti-labor initiatives when in February 2011, he moved to strip collective bargaining rights from teachers and public employees. “At least Scott Walker had the backbone to barge through the front door” and propose his legislation, argued Senate Minority Leader Gretchen Whitmer, a pro-labor Democrat from East Lansing. Michigan’s Snyder, who suggested for months that he was not interested in advancing “right to work” legislation, suddenly shifted position at the eleventh hour, when he sided with the most rigidly anti-labor of his party’s legislators. Whitmer got that right. But the cowards were in charge Thursday. As in Wisconsin, where crucial elements of Walker’s anti-labor law have been ruled unconstitutional by the courts, the Michigan legislators bent the rules of their chambers to rush the law to Snyder’s desk. Ultimately, those abuses could end up preventing implementation of the law—although that’s a hope rather than a certainty. There is also the hope that voters in a state that voted overwhelmingly for President Obama and Democratic Senator Debbie Stabenow on November 6 will eventually elect a new pro-labor governor and legislature. The determination to fight for labor rights runs deep in Michigan. It’s a part of the state’s history, and UAW President King says it is far from finished.